A new kind of Mario game that you can play with one hand. 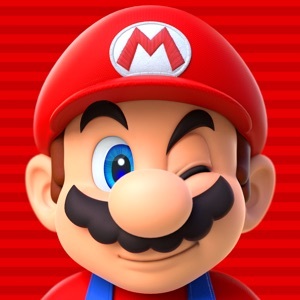 You control Mario by tapping as he constantly runs forward. 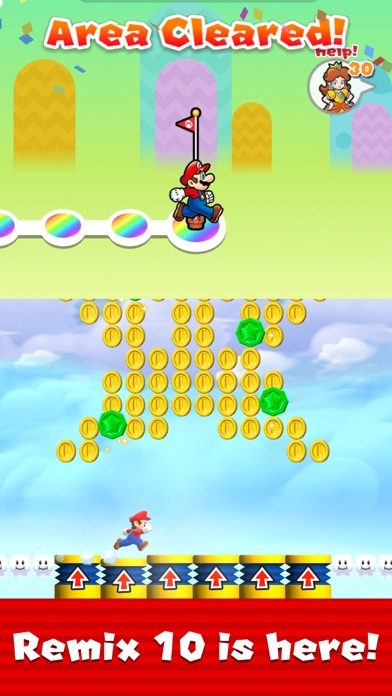 You time your taps to pull off stylish jumps, midair spins, and wall jumps to gather coins and reach the goal! Super Mario Run can be downloaded for free and after you purchase the game, you will be able to play all the modes with no additional payment required. You can try out all four modes before purchase: World Tour, Toad Rally, Remix 10, and Kingdom Builder. 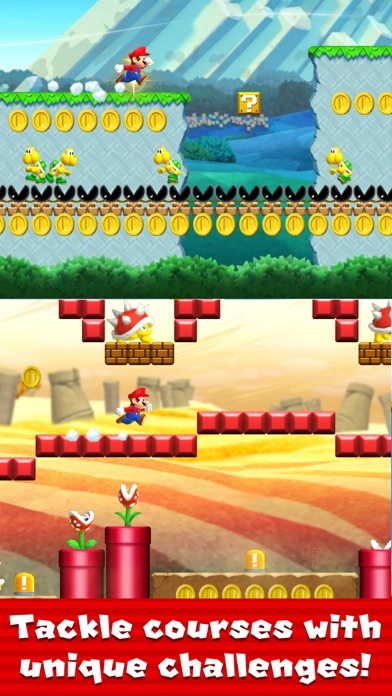 ■World Tour Run and jump with style to rescue Princess Peach from Bowser’s clutches! Travel through plains, caverns, ghost houses, airships, castles, and more. Clear the 24 exciting courses to rescue Princess Peach from Bowser, waiting in his castle at the end. There are many ways to enjoy the courses, such as collecting the 3 different types of colored coins or by competing for the highest score against your friends. You can try courses 1-1 to 1-4 for free. After rescuing Princess Peach, a nine-course special world, World Star, will appear. ■Remix 10 Some of the shortest Super Mario Run courses you'll ever play! This mode is Super Mario Run in bite-sized bursts! You'll play through 10 short courses one after the other, with the courses changing each time you play. Daisy is lost somewhere in Remix 10, so try to clear as many courses as you can to find her! ■Toad Rally Show off Mario’s stylish moves, compete against your friends, and challenge people from all over the world. In this challenge mode, the competition differs each time you play. Compete against the stylish moves of other players for the highest score as you gather coins and get cheered on by a crowd of Toads. Fill the gauge with stylish moves to enter Coin Rush Mode to get more coins. If you win the rally, the cheering Toads will come live in your kingdom, and your kingdom will grow. ■Kingdom Builder Gather coins and Toads to build your very own kingdom. Combine different buildings and decorations to create your own unique kingdom. There are over 100 kinds of items in Kingdom Builder mode. 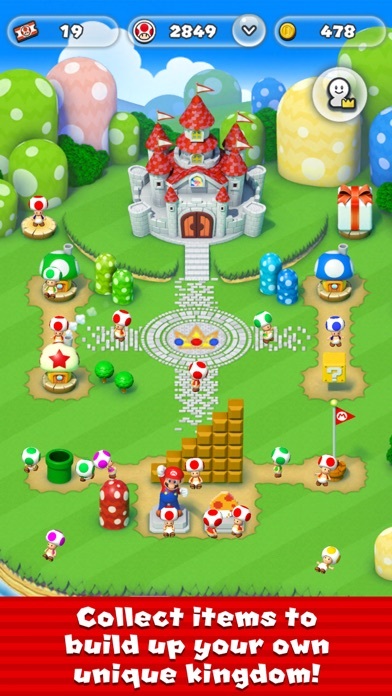 If you get more Toads in Toad Rally, the number of buildings and decorations available will increase. With the help of the friendly Toads you can gradually build up your kingdom. ■What You Can Do After Purchasing All Worlds ・ All courses in World Tour are playable Why not try out the bigger challenges and thrills available in all courses? 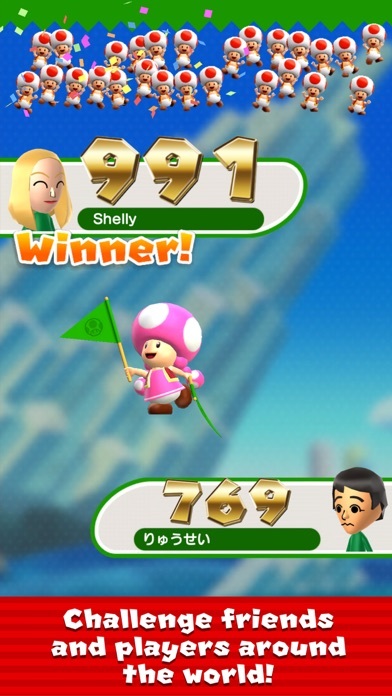 ・ Easier to get Rally Tickets It's easier to get Rally Tickets that are needed to play Remix 10 and Toad Rally. You can collect them in Kingdom Builder through Bonus Game Houses and ? Blocks, by collecting colored coins in World Tour, and more. 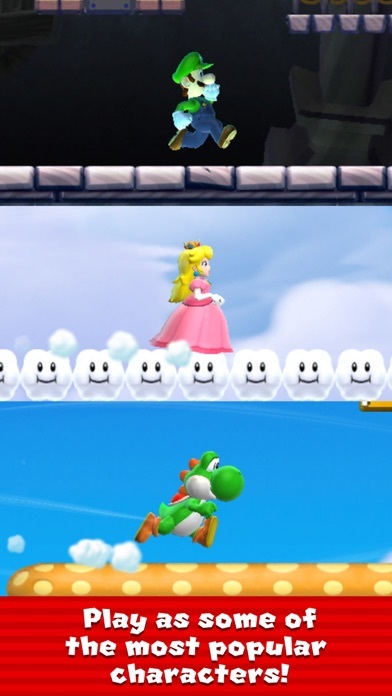 ・ More playable characters If you rescue Princess Peach by completing course 6-4 and build homes for Luigi, Yoshi, and Toadette in Kingdom Builder mode, you can get them to join your adventures as playable characters. They play differently than Mario, so why not put their special characteristics to good use in World Tour and Toad Rally? ・ More courses in Toad Rally The types of courses available in Toad Rally will increase to seven different types of courses, expanding the fun! Along with the new additions, Purple and Yellow Toads may also come to cheer for you. ・ More buildings and decorations in Kingdom Builder The types of buildings available will increase, so you'll be able to make your kingdom even more lively. You can also place Rainbow Bridges to expand your kingdom. ・ Play Remix 10 without having to wait You can play Remix 10 continuously, without having to wait between each game. *Internet connectivity required to play. Data charges may apply. *May contain advertisement.